The Royal National Lifeboat Institution (RNLI) are a vital part of coastal life in Britain and Ireland. Patrolling around 19,000 miles of coastline, with a total fleet compliment of over 400 lifeboats, the RNLI team provide essential safety support on our beaches and around inland waterways. In celebration of the rich history of the RNLI, a new exhibition displays the work of the Beken family - dedicated maritime photographers, working from the early 20th Century - as well as the present day photographs of Jack Lowe, taken as part of his extraordinary Lifeboat Station project. 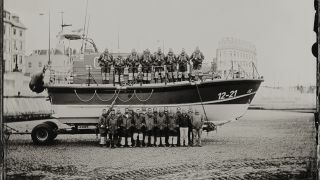 The exhibition at Poole Museum guides visitors through time, spanning 100 years of the RNLI's journey. Importantly, all of the images present were captured on glass plates, creating a sense of timelessness, thereby highlighting the ongoing and unchanging role the organisation plays in maintaining safety. The Beken's work documented lifeboats, many of which were constructed on the South Coast, not far from the current RNLI headquarters in Poole. These images captured the boats early in their lives, before they began their vital work protecting people at sea, across Britain. This knowledge adds a degree of poignancy and intrigue to the photographs, especially since not every boat would return from all of their dangerous missions. One floor of the display is dedicated to the work of Jack Lowe, who despite living in the digital age and being an expert in modern photographic technology, chose to conduct his Lifeboat Station Project using similar glass plate techniques to those used for the images captured almost a century before his frames. Commenting on this decision Jack explains that the process involves his subjects, creating the feeling that each image is a joint effort. This adds a sentimental aspect, which raises the significance of the photographs to more than that of a mere snapshot of a single moment. It helps Jack tell a story of the emotions and values held by the crews of each lifeboat station. Jack travels the country in Neena, an ambulance converted into a mobile darkroom, which allows the plates captured for the project to be processed on-the-move. While it took Jack some time to become accustomed to the on-board systems, the previous function as a mobile medical lab makes it the perfect vehicle for keeping the project on the road. At this current rate Jack doesn't expect to complete the Lifeboat Station Project until 2022. It has become Jack's life work, bringing together his skills as a printer, post processor and photographer. Visit the project's website to find out more, engage with the community and discover how you can support what has become one of the most ambitious photographic endeavours of it's type attempted.